Momentum is building on Capitol Hill for the Trump administration to reopen an investigation into former Democratic presidential candidate Hillary Clinton and her connections to an anti-Trump dossier that served as the basis for an ongoing investigation into President Trump and collusion with Russia during the 2018 election, according to lawmakers who spoke to the Washington Free Beacon. As the Department of Justice investigation into claims Trump colluded with Russia drags on, a delegation of Republican members of Congress led by Rep. Lee Zeldin (N.Y.) is pressuring the DOJ to appoint a second special counsel to investigate why the FBI dropped its investigation into Clinton's use of a private email server while serving as secretary of state, as well as further information that her supporters in the FBI may have targeted Trump in an effort to undermine his candidacy. The lawmakers maintain that new evidence discrediting the anti-Trump dossier—which was assembled by the opposition research firm Fusion GPS on the Clinton campaign's behalf—warrants the appointment of a new special counsel that would be tasked with investigating FBI bias and unwarranted spying on Trump associates. The call for a second special counsel comes as Attorney General Jeff Sessions appointed attorney John Huber to lead an internal Justice Department review of Special Counsel Robert Mueller. Zeldin, however, says this decision does not go far enough. A second special counsel must be appointed to investigate potential mishandling of the case at the highest levels of the FBI and DOJ. Zeldin and others in Congress remain concerned the ongoing probe into Trump is being mishandled and has become a witch-hunt to indict the current president and his allies at all costs. "Evidence has come to light that raises serious concerns about decisions and activities by leadership at the highest levels of the Department of Justice and Federal Bureau of Investigation regarding how and why the Clinton probe ended and how and why the Trump-Russia probe began," Zeldin and 12 other lawmakers wrote to Attorney General Jeff Sessions in a recent letter. The effort recently garnered further support in Congress, when Republican House Majority Leader Kevin McCarthy (R., Calif.) and Rep. Steve Scalise (R., La.) lent their support to the effort. There is additional concern that warrants executed by the secret Foreign Intelligence Surveillance Act courts, or FISA, were obtained by the FBI using now-discredited information provided in the anti-Trump dossier, which was originally assembled by onetime British spy Christopher Steele. "Important questions have been raised with regards to FISA warrants targeting U.S. citizen Carter Page," a former Trump adviser, the lawmakers write. "We write to urge you today to appoint a special counsel to investigate these decisions and activities." Zeldin, in an interview with the Free Beacon, said the disappearance of the probe into Clinton, as well as the disclosure that FBI and DOJ officials handling the Trump probe had ties Clinton, warrants the appointment of a new special counsel that could investigate the entire situation without bias. The recent appointment of Huber does not go far enough, according to Zeldin, who said. "a second special counsel is still the way to go under these circumstances." "We know that at the highest levels of the DOJ and FBI there was an anti-Trump bias that existed," Zeldin said, referring to multiple reports that senior FBI and DOJ officials communicated their loyalty to Clinton. "There were relationships that existed with Hillary Clinton. The process was not followed anywhere near where it should have been followed." A DOJ spokesman told the Free Beacon they had received Zeldin's letter, but would not comment further. Zeldin criticized current Special Counsel Robert Mueller, who he accused of reaching far past the mandate granted when the initial Russia probe was opened. "It appears that the current special council's probe is meandering far adrift of the mandate that it was created for," Zeldin said. "The special council that exists was created to look into the 2016 election and investigate Russian interference. At this point, spring now of 2018, I am still not aware of any evidence at all that President Trump colluded with the Russians, no evidence at all." The congressmen are particularly concerned with the process undertaken to obtain FISA warrants that permitted secret spying on U.S. citizens tied to Trump. It is believed that officials seeking the warrants presented the anti-Trump Steele dossier as evidence to support their claims of collusion. However, it remains unclear if FISA judges were aware the dossier was paid for by the Clinton campaign and highly suspect, according to Zeldin. "With regards to the FISA abuse, there was a lot of information that was deliberately withheld from the FISA judges," he said. In their fervor to open a case into Trump, it is possible that FBI and DOJ officials pursuing the case withheld evidence from the FISA court in order to obtain spying permissions, Zeldin said. "If you're going to choose to use an unverified dossier paid for by Hillary Clinton and the DNC, if you're going to choose to use it you're going to have to let the court know you didn't verify the document," Zeldin explained. A second special counsel could investigate these matters and more. "This is all just part of a wide ranging amount of actual evidence that exists that we know about, and who knows how much more exists that we don't know about," Zeldin said. "None of that is being investigated by a special council, while you have a special council that does exist not yet demonstrating at all any evidence whatsoever of President Trump colluding with the Russians, or providing any indication they're looking into anything else that involved the misconduct now exposed." The circumstances under which the Clinton probe ended and the Trump investigation began are highly suspect, according to Zeldin. 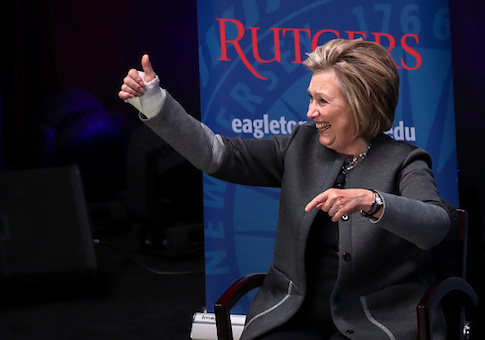 "It's already known that there was wrongdoing as it relates to how and why the Clinton probe ended and how and why the Trump probe began," Zeldin said. "There was an investigation launched against President Trump and his family for winning the election without any evidence they committed a crime to win the election. I have a problem with that." This entry was posted in Issues and tagged 2016 Election, Donald Trump, Hillary Clinton, Robert Mueller. Bookmark the permalink.